WikiBranding: Damn right it sells. I've been a fan of Canadian Club's "damn right" campaign from my first sighting. It's audacious and completely counter-intuitive. Selling an out-of-date brand to younger customers is not easy. So I was really glad to read the Ad Age article reporting that the campaign is increasing sales and reversing years of downward spiral. The insight is so simple: you're dad was a lot like you my friend, going out, pounding drinks and looking to score. But he did it with style. The line is perfect -- "Damn right your dad drank it." It's always good to see a client rewarded for embracing a bold idea. 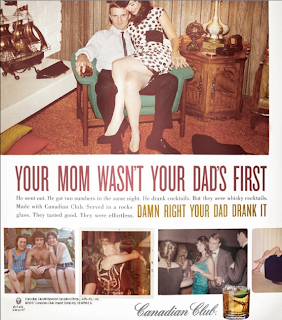 Kudos to BBDO and the brand managers at Canadian Club.